The Pacific Council embraces the inclusion of all voices in our community, across our membership, staff, Board of Directors, event speakers, and guests, regardless of race, ethnicity, ability, class, religion, age, gender identity, sexual orientation, or any other differentiating characteristic. To solidify and guide our commitment to inclusivity and diversity, the Pacific Council has formed a staff committee dedicated to creating programs and opportunities that elevate underrepresented voices in our membership. Our Pay It Forward Annual Giving Campaign, launched in 2016, aims to build a network of tomorrow’s thought leaders from all corners. We also continue to fulfill a promise made at the beginning of 2017 to feature women experts on all of our panels. In late 2018, Pacific Council President and CEO Jerry Green shared a vision for the Council as it approaches its 25th anniversary in 2020. He said the Pacific Council must reflect the evolving character and composition of our community through our membership, leadership, staff, and programming. To this end, the Pacific Council strives to change the face and practice of global affairs. It is our goal to set a new standard for diversity, equity, and inclusion in our field. As we move toward the future, we hope to better mirror the broader community in Los Angeles, the city we call home. We are aiming for more diverse representation across our membership, staff, and Board of Directors, especially in the area of gender parity, and we laid the foundation for that goal in 2018. We welcome and support diversity in all its forms; indeed, we believe it is the only way to effect change on global issues. Our organization’s commitment to representation that reflects the wider elements of human difference in society. We currently focus on five key diversity indicators: race and ethnicity, gender, age, geography, and profession, but recognize a broader understanding of the wide psychological, socioeconomic, and physical differences that occur amongst individuals. Access to fair treatment and the opportunity to contribute ideas, perspectives, and leadership within the organization. We strive to identify and eliminate barriers that have prevented the full participation of underrepresented groups in international affairs, supplanting those barriers with new platforms for speech and inquiry. The act of creating environments in which any individual or group can be and feel welcomed, respected, supported, and valued within the Pacific Council community. An inclusive and welcoming climate acknowledges historical barriers to full participation, embraces differences, and offers respect through the words, actions, and thoughts of all community members. 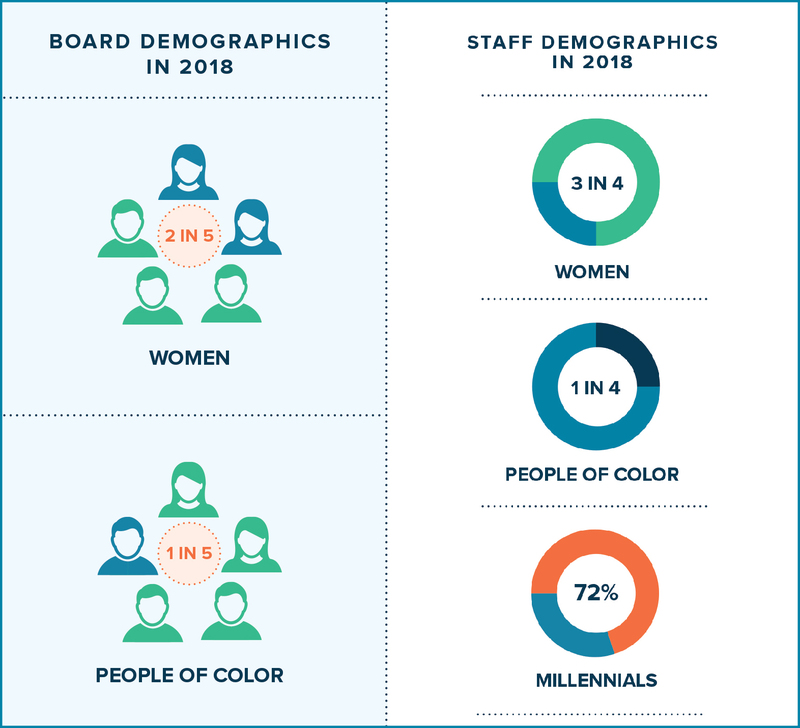 See below for 2018 demographics of our Board of Directors and staff.